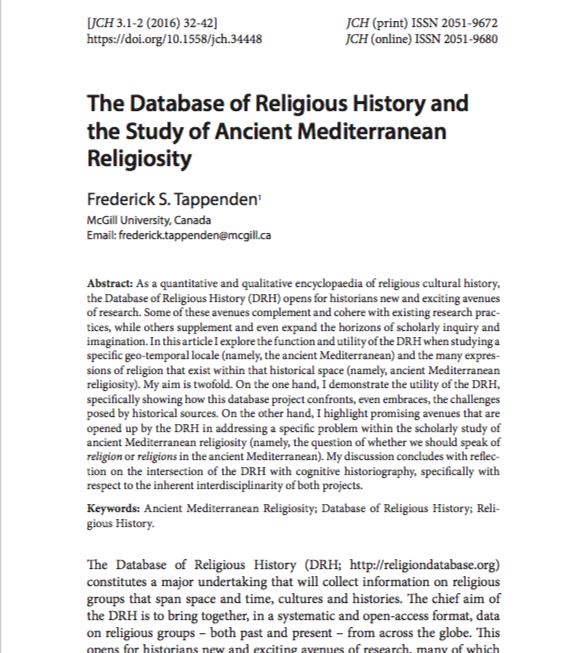 “The Database of Religious History and the Study of Ancient Mediterranean Religiosity.” Journal of Cognitive Historiography 3.1–2 (2016): 32–42. As a quantitative and qualitative encyclopaedia of religious cultural history, the Database of Religious History (DRH) opens for historians new and exciting avenues of research. Some of these avenues complement and cohere with existing research practices, while others supplement and even expand the horizons of scholarly inquiry and imagination. In this article I explore the function and utility of the DRH when studying a specific geo-temporal locale (namely, the ancient Mediterranean) and the many expressions of religion that exist within that historical space (namely, ancient Mediterranean religiosity). My aim is twofold. On the one hand, I demonstrate the utility of the DRH, specifically showing how this database project confronts, even embraces, the challenges posed by historical sources. On the other hand, I highlight promising avenues that are opened up by the DRH in addressing a specific problem within the scholarly study of ancient Mediterranean religiosity (namely, the question of whether we should speak of religion or religions in the ancient Mediterranean). My discussion concludes with reflection on the intersection of the DRH with cognitive historiography, specifically with respect to the inherent interdisciplinarity of both projects.